If you’ve been reading PopCult over the last few months, then you know that this year has seen quite the revival of Johnny West and The Best of The West action figure line originally made by Marx. The Best of The West toy line was a mainstay of toy retailers from 1965 to 1975 and the line encompassed well over a dozen figures of Cowboys and Indians. But another component that added a great deal of play value to the line was the horses. Starting with Johnny West’s faithful steed, Thunderbolt, and including several different 1/6 scale horses of varying sizes and articulations, the horses were a huge part of the success of The Best of The West line. Now, some of the original molds for Thunderbolt have been acquired by Stevo’s Toys, and the owner, Steve Corn (AKA “Stevo”), has put Thunderbolt back into production with the trusty steed and his saddle and gear once again made in the USA, sporting details painted by Stevo, himself. . 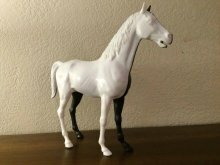 The first batch of horses were produced in white, a color that Marx never used in the United States back in the day and Stevo has created a few different painted color schemes which he now has for sale. 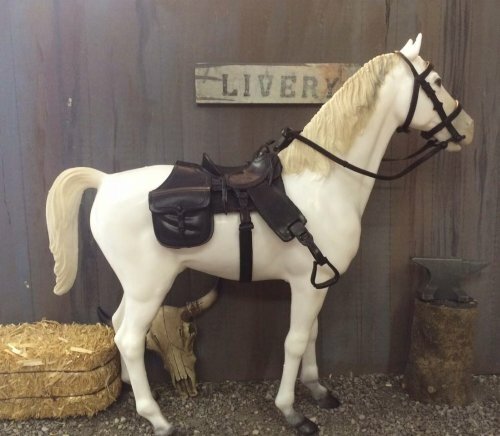 Finally, customizers who wanted a white horse for The Lone Ranger or (the original) Ghost Rider have the equine of their dreams! 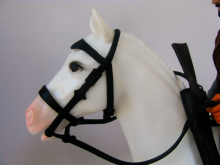 For our photo shoot we feature the new Thunderbolt, with sand colored hooves, pink nose and black eyes, and decked out in black tack. Posing unclad for us is Ghost, with dark grey/black mane, tail and hooves, and black eyes. 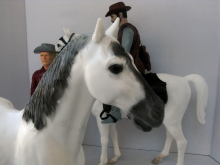 Ghost comes with light brown Western tack, but we left it off so you could see the full sculpt of the horse. 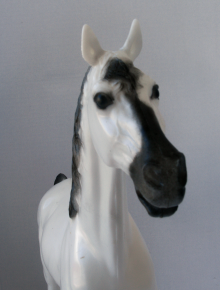 The original Thunderbolt sculpt was and remains one of the best-executed toy horses ever produced. Every detail from the head to the tail is perfect. I’m glad to report that the mold does not show any loss of that detail, despite being fifty years old. Over at his website, Stevo has a great photo essay showing the molds and how he came to purchase them to make this new run of an old favorite. The mold is a classic, no doubt. 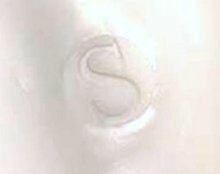 This is the original Thunderbolt horse that many of us grew up with and the only change is that Stevo has had the Marx “brand” replaced with an “S” so that collectors won’t be confused by his reproductions. This is a terrific project. First of all, with what seems like an onslaught of brand new figures being created in Mexico using the original molds, it’s a blast to be able to get new horses for these cowpokes to ride. 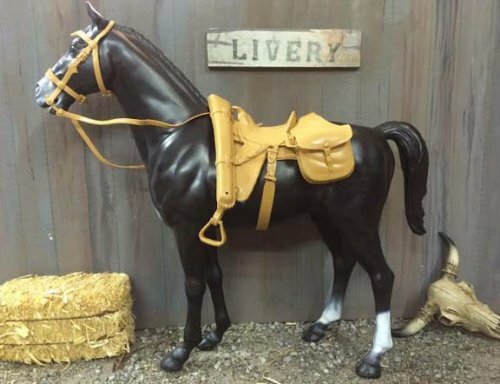 Each horse comes with a complete set of Western tack molded in either black or light brown, plus a set of helpful instructions to show you the correct way to outfit the saddle and bridle and properly dress your horse. I have to admit to considerable and pleasant pangs of nostagia as I prepared my new Thunderbolt for our photo shoot. These are very affordable reproductions with lovely paint jobs and are a must-have for anyone who has picked up any of the 50th Anniversary Johnny West boxed sets being sold by Classic Recasts. 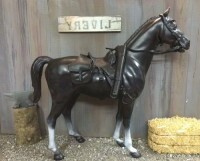 Since I received my horses a few weeks ago, Stevo’s Toys has received a second batch of horses molded in black. These are currently being offered in a couple of styles, including “Satan,” the horse belonging to the outlaw, Sam Cobra, which was listed in Christmas catalogues back in the early 1970’s, but was never actually sold under that name. After all these years, Cobra finally has a horse of his own and can stop stealing Johnny’s. Stevo has also made a few limited edition pieces available, one of which was a gray swirled Thunderbolt, created while testing the molds and sold unpainted, with barely more than a dozen made. Another new curiosity, posted to Facebook, is a Thunderbolt horse comprised of a black half and white half glued together. This horse, which looks really cool, seems to remind everybody of the Charons, the alien race of two-tone humanoids from Star Trek: The Original Series. I don’t think this horse has been made available for sale, even though it looks really cool. 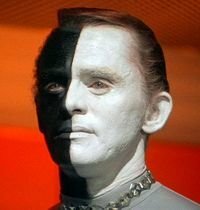 There’s just not a lot of crossover between Star Trek, 1/6 scale hobbyists, devotees of Johnny West and fans of Mr. Horse, from Ren and Stimpy. The new generation Thunderbolt from Stevo’s Toys is a welcome addition to the ranks of re-issued Marx toys currently populating the market. 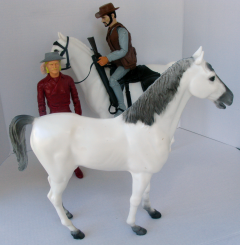 With the added bonus of being made in the USA and appealing not only to Marx action figure collectors but also to the Breyer horse hobbyists, we can only hope that Thunderbolt sticks around for further iterations, perhaps as a sorrel, tan, dark brown, or Pinto mount for Johnny West and his friends and foes. 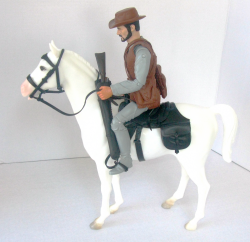 Stevo’s Toys also offers up a wide range of hand-made 1/6 scale Western Accesories for the Best of the West figures. For our photo shoot, the horses were joined by a new red General Custer from Classic Recasts and a classic Mountain Man from Circle X Ranch/Marxman Bros.Creations. You can contact James Wozniak and Terri Coop at the links below concerning the availability of those figures and additional figures and gear. Special thanks to Lee Harrah for photographic assistance. Below are two more of the new horses offered by Stevo’s Toys that we haven’t seen in person yet. They are still quite impressive. I own, on large mylar, a factory drawing of the horse halves, showing the “pin-and-socket ” joining scheme. Once I dig it out of storage I will see how much a blueprint maker will charge for prints and let you know. Originally, this pencilled popcult portrait was purchased by the late Gene Scala, et al in the early 1980s as part of the huge Marx factory hoard. Stevo is a great guy and his stuff is first rate! Thunderbolt is alive and well! Hey Paul, would love to see your project prints! It very cool that someone who grew up with johnny west and horses now owns the molds. Good Going Stevo !! Keeping the Fun Alive !! It is nice to see a well written article accompanied by high quality pictures. REALLY nice piece!